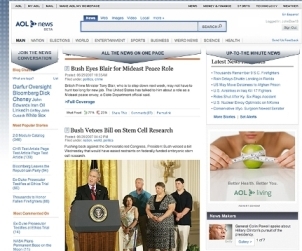 The leader in online news, AOL News, now presents to you a makeover site which is blog-like. The new AOL or AOL News Beta reports news in blog template – short news stories that are accompanied by video clips, photographs or interactive polls intended to engage readers. Users can read, watch, vote, rate, comment and even discuss the news. AOL revealed that the makeover of its traditional news sites is part of the effort to change this site from a subscription-based service to a free, advertising-based Web business. At the same time, AOL Sports also started a similar format for its sports news. The change of AOL is encouraging and it is a good move as the blog style is reflective of a general shift in how consumers prefer to get information on the Web. In time to come, more internet websites will most likely adopt this blog-format for better hits.